A team of Indiana University journalists is reporting for the Final Four Student News Bureau, a project between IU, National Sports Journalism Center and the NCAA at the men’s tournament in Indianapolis. For Butler, the road ended here. The phrase coined for this years NCAA tournament finally rang true for the Bulldogs on Monday night, after a 61-59 loss to Duke, for its fourth national championship. After the game, Duke fans mocked the hometown team with chants of ‚”Our house,” But they did it only after the second of two shots from Butler forward Gordon Hayward careened off the rim. Its campus only six miles away from Indianapolis‚ Lucas Oil Stadium, Butler had a shot at becoming the lowest seed to win an NCAA championship since Villanova in 1985. Butler would have been the smallest school to win a final since the tournament expanded to 64 teams in 1985. 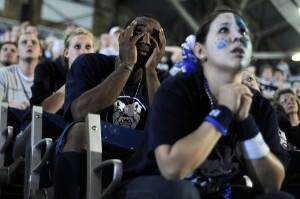 But unlike Villanova, Butler couldn’t continue its run of upsets. It lost to No. 1 seed Duke, the only top seed advancing to the Final Four. Butler players disagreed about what they would remember from this game. Guard Shelvin Mack said he felt his team played hard, and he wouldn’t allow the loss to cloud his memories of the 2009-10 run to the finals. Hayward was the last player to touch the ball on Butler’s final possessions. He took the defeat hardest, vowing not to let go that his team didn’t come out the victor. “For me, it’s going to be the loss,” Hayward answered. The Bulldogs had dispatched the West Region’s No. 1 and No. 2 seeds, Syracuse and Kansas State, before defeating Michigan State in the Saturday semifinals. Based on past performances, Butler was optimistic. Bulldog fans on the streets of Indianapolis barked when they saw a pack of royal blue Duke shirts nearby. The Bulldogs hadn’t been on the wrong side of a game since Dec. 22, and they clung to a 25-game win streak going into the championship. Butler got the tip and the games first possession. It scored the games first points, as center Matt Howard was fouled and hit two free throws. A quick answer came back, though. Nolan Smith hit a baseline 2-pointer to knot the game at 2. From there on, it would be a fight. Both teams challenged each other to defend. Duke put in 44 percent of its shots, and Butler hit more 3-pointer than the outside-shooting Devils. The score was 33-32 at half, with Duke clinging to the lead. Butler had out rebounded a Blue Devil team known for its ability on the offensive glass, 24-17. The second half began with a duel. Each team one-upped the other with drives to the basket over challenging defenders. Butler center Matt Howard slowed for a moment, perhaps from the effects of his concussion in Saturday’s semifinal win over Michigan State. The Bulldogs third-leading scorer had seemed slower and less attentive in the first half. Then, early in the second, Howard committed a charge on offense. He was the last player to get back for defense. Then Howard got his third foul at 17:21 in the second half. His fourth came at the 14:10 mark. With its big man essentially out of commission, Butler needed help on offense. Down the stretch, the Bulldogs best players, Mack and Hayward, provided wowing plays and each finished with 12 points. Other than that, though, things were pretty bleak from the Butler offense. Guards Willie Veasley and Ronald Norad got open looks from Duke, daring them to shoot. They did. They missed, and Duke rebounded. Veasley and Norad shot a combined 4-of-17 and scored a total of 9 points. Avery Jukes provided some sense of solace for the other Butler players. When presented the same shots, he hit a better percentage and shot 4-of-6, scoring 10 points. The Blue Devils balanced offense served as a perfect opposite. Several players were capable of making their own shots. Three-pointers, midrange jump shots and floaters rained in, and Duke forward Kyle Singler led the charge. “Singler was obviously the toughest for us to guard because of his size,” Stevens said. And Dukes Brian Zoubek was responsible for the possessions that allowed Singler to score. He had 10 of Dukes 37 rebounds. In the end, Butler simply met a team meant to win this seasons championship. The veteran players at Duke hadn’t made a Final Four in their careers. Bounced in the first, second and Sweet 16 rounds in successive years, Duke had paid its dues. And coach Mike Krzyzewski, in his 11th Final Four, knew how to get the Blue Devils over the hump. Against Stevens, he faced off with a coach in his third year at Butler. Krzyzewski, in his 30th year, had Duke in its first title game since it won in 2000-01 season. Yet Butler didn’t care about the numbers. Stevens said he knew his players expected more than an appearance in the final game. “You can see it listening to all three guys,” he said. “They didn’t want to come over here and roll over. They wanted to win.